Tent at Ancient Lakes in early spring. Ancient lakes may be the perfect spot for beginners. The trail is flat and easy, and the basin is so large you rarely have to worry that you won’t be able to find a spot to set up your tent. There are a lot of surrounding trails to explore, so once you set up camp take some time to explore the area. Ancient lakes also makes a great early season backpacking trip. Snow melts out early here and the temps are generally warmer than they are west of the Cascades. I have backpacked here in early March and April and it’s felt similar to summer in the mountains. Perfect for getting out when the mountains are still inaccessible! You can read a detailed trip report from my last trip to Ancient Lakes from Doris. You will need to pack in all the water you need as the lakes are irrigation run off and not potable, even after filtering. There are plenty of campsites, but it gets busy in spring and summer so don’t expect isolation. Multiple trailheads lead you to this basin so make sure you are at the right one. I type “Ancient and Dusty Lake Trailhead “ into Google Maps to get to the shorter trail. Photo taken on my first backpacking trip to Barclay Lake. Barclay Lake is dear to my heart as it was my first backpacking trip! Shortly after adopting Kuma, I decided I was tired of waiting for someone to backpack with me to make a trip happen. So, I packed everything up and took Kuma out for a night in the woods—alone. The hike is short so I figured if I was miserable, I could always pack up and hike out easily. Kuma may have chewed through his long leash and I may have accidentally dehydrated myself by being too lazy to filter enough water, but Kuma and I had a great trip! Now I always recommend this to people looking for a good spot for their first-time backpacking. There are limited campsites at Barclay Lake and since it’s a short hike it gets fairly busy on weekends. Hike out early if you can or try for a weeknight instead. Second Beach during the winter. The Northern Coastline of Washington is one of my favorite places in my home state. The beaches have gorgeous sea stacks and Second Beach is no exception. To get to the beach you hike down a winding trail that is part staircase, all of the gain will be on your way out. There are streams you can filter water from, but I elected to pack in all the water I needed as it’s such a short hike. After you set up camp, wait for low tide to explore around the sea stacks. We saw all manner of sea creatures in the tide pools around sunset when I backpacked here. You can read detailed trip reports from our trip to Second Beach from Sarina or Amanda. Second beach is part of Olympic National Park so you need a permit to camp there. You can pick one up at the ranger station in Port Angeles on your way to Second Beach. The park also requires food be stored in a bear can. The ranger station can rent one to you when you pick up your permit, or you can supply your own. You will also need to keep an eye on the tide. Camp behind the debris line on the beach and consult a tide chart to make sure you don’t wake up wet in the middle of the night! These trips are still good for beginners but require a little more effort and commitment than the three I have listed above. Check them out when you are ready for a little more of a challenge! This trail is a little longer than the ones above, but the views are worth it. Baker and Shuksan will greet you when you arrive into the basin below Yellow Aster Butte, and you can take a side trip up to the butte after dropping your pack at camp. This trail is great for those looking for a little bit more of a challenge and epic views. This trail is extremely popular on summer weekends, arrive early to get your choice of prime camp spots. If you want some of the most gorgeous views for not much work, Skyline Divide is the trip for you. You will camp along a ridge and open your tent door to see Mount Shuksan and Mount Baker if you pick the right campsite. There are spots to camp all along the ridge, or you can hike down into a basin and camp there. Click here if you want to read a detailed trip report from my trip to Skyline Divide from Sarina. All waste needs to be carried out of Skyline Divide—aka—bring blue bags. You can pick them up at the ranger station on your way or bring your own. There is no water source on the ridge so once the snow melts out you will need to pack in all the water you need. For a one-night trip in July I packed in 4.5 liters and used all of it. It adds a bit of weight to your pack so keep this in mind if you backpack here. 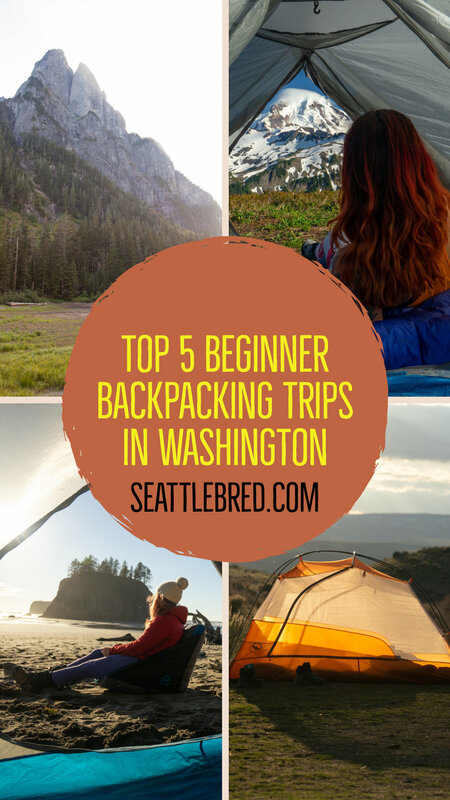 This is just a sample of the beginner trips Washington has to offer. If none of these are calling your name check out WTA to find a trip that does! I’d love to know where you went for your first backpacking trip and what was special about it in the comments!